DC Gustafson's Blog – Join me on my journey to become a published author. Join me on my journey to become a published author. For Christmas I received a DVD box set which contains the second of my primary muses–the complete series of the original Jonny Quest. 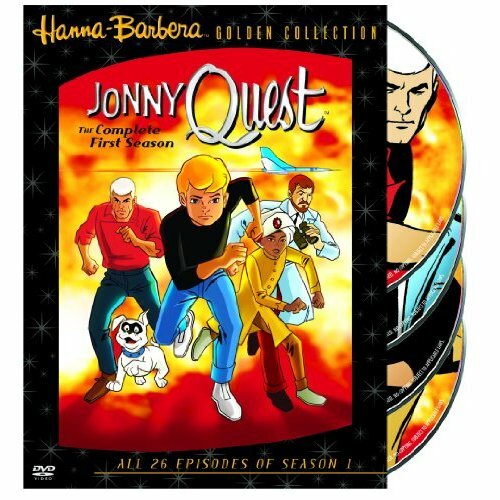 I don’t know what age I was when I discovered Jonny Quest, I just know that it imprinted on me like few shows ever have. Its haunting artistic style, sense of adventure, and non-stop action were unlike any cartoon or even any other show during my childhood. Looking back I realize it was a Saturday morning cartoon equivalent of old time radio adventure. Only recently did I discover that the series was inspired by (and originally meant to be) the OTR show Jack Armstrong, Alllllllll American Boy. In my humble opinion, it greatly surpasses its inspiration, but they are two different mediums and eras, so perhaps it’s an unfair comparison. The thing I enjoyed most (and still enjoy) about Jonny Quest was its sense of atmosphere. To a kid it felt like a true adult adventure, not a pacified kiddie story. The family faced serious threats such as dangerous locales, actual gunfire, and frightening creatures. This was not some simple kid’s program featuring ineffectual villains and harmless plots. The stories had a real sense of suspense and a fear for the heroes’ safety. The creature arrives mysteriously, eluding interception with ease. Then it is discovered by the Quest family. What could this strange creature be and where did it come from? After the seemingly benign creature is brought into the army base, the creature secretly begins stalking about on some secret mission. Moving about like a massive spider, it strikes from the shadows, incapacitating any adversaries with its paralyzing attack. I remember well the creature’s design, the haunting way it moved, and the way it struck out with its paralyzing antenna. Even with its simple shape and detail (it’s basically a ball, with one eye, and four stick legs), the show gave a proper eerie presence to the thing, making it seem more real than many higher-budget movie monsters. Then there was the setting. Whether they were facing monsters or not, the Quest gang usually travelled to exotic locations, which presented new sights, features, and dangers. The world seemed that much smaller and more vibrant as they circled the globe, going places I would never see. This added variety was another way that the series kept each episode from feeling too similar, even if half of them could be categorized as monster hunts. Although the animation itself was often crude and imperfect, the actual art (especially anything fully painted) in the series communicated the setting, the suspense, and the dangers in vivid fashion. The lavish jungles, the skulking yetis, and the futuristic vehicles all were designed and painted with a style taken straight from the covers of the best pulp magazine covers. In actuality the art for Jonny Quest has spoiled me by making me judge most pulp covers against its art and stories. Of course many pulp covers have art just as good or better, but they are usually far too distracted by trying to sell covers with half-naked women. The art of Jonny Quest is more family friendly and, to a degree, more varied, since it doesn’t need to rely on that trope. As I research and discover more “true” pulp stories and art, I often find myself comparing it back to Jonny Quest and I often find it to be my preferred version of the pulp world. Since my desire is to create a fairly friendly pulp world of my own, I see this as combining the best of both worlds. 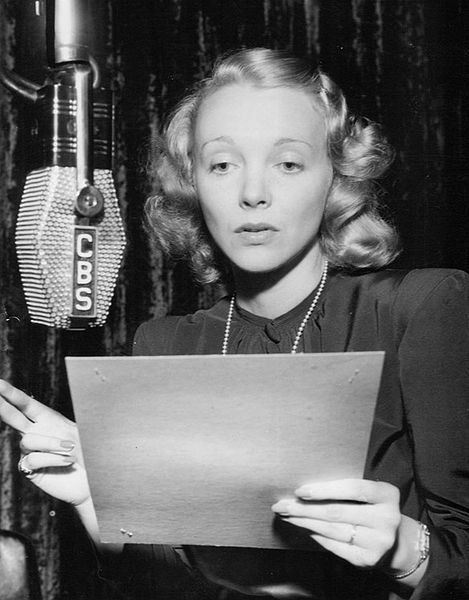 Photo of actress Virginia Bruce from the radio program Suspense. As I launch my blog and publicize my attempt journey to become a published author, I thought I would start by reflecting on the primary inspirations behind my latest writing projects. First stop on the tour is the greatest of the three: old time radio. My love of old time radio started back in the day before minivans, when my whole family (all six of us) would pile into the big blue station wagon and head down to Florida to visit Grandma, Grandpa, and sometimes Mickey Mouse. It was a three-day trip and my parents did a good job of finding a variety of things for us to do. One of my favorites usually started after dark, when we were restricted in what things we could do. We listened to cassette tapes of old radio programs on our cheap little mono tape recorder. These shows included Abbott and Costello, Fibber McGee and Molly, and the Lone Ranger. I loved them all, but my favorite was probably the Lone Ranger, because I’m a sucker for an idealistic hero and a good adventure story. Fast forward to several years ago. I was looking for some new radio stations to listen to online and I just happened across a few that featured old time radio programs (OTR). Intrigued, I tried them out and was instantly enthralled. As I’ve said, I love a good adventure and OTR is full of them. My favorite shows quickly became Suspense and Richard Diamond, Private Detective and there were countless more that I enjoyed such as Escape, The Whistler, Inner Sanctum, and The Shadow. Eventually I discovered modern takes on OTR, such as the outstanding Decoder Ring Theatre and The Sonic Society. Long story short, I love old time radio, and I find it a constant source of inspiration that enables me to pull ideas from many different genres. In the span of 30 minutes you can visit the most amazing places and have incredible adventures, which in many ways are more captivating than any film, because you supply the visuals yourself. And now, as a writer, I find it hard to read all the books I want while keeping up with my writing, but I can always find some time to squeeze in a “half hour of high adventure.” As long as I have my OTR, I’m sure I’ll always have more story ideas than I could ever write.